A story had gone viral a few weeks ago about a young woman who told her colleagues via email that she was out so she could focus on her mental health. She promised to return the following week fully refreshed. The CEO responded, and he was very supportive of her decision to take care of her mental health. To me, this was very important. So often are people so afraid of the negative stigma attached to mental health. If some of us are reluctant to take off for physical illness, how much more difficult is it to ask for a day to gain peace of mind? So, we tend to just shrug off our mental health and deal with it. I’ve been very open about my PPD and PPA struggles both personally and professionally. Sometimes, it was hard to hide. I’ve also been dealing with my struggle of being a working parent. Combine that with work stress, and little self care, and it can be taxing for anyone. So, I used that young lady an example. Long story short, I too took a mental day off. I had to work very late the day before since I had asked for it last minute , but it was worth it to get away for even a day. On that Friday, my mother in law was still came over to watch my son. The day off meant that I was supposed to focus on things I wanted: SLEEP, baby time, hobbies. Exercise if I could, but I can tell you right now, it wasn’t a priority that day! I did exactly what I wanted. My mother in law came later than usual, so I slept in, and baby and I spent quality time when he woke up. I get refreshed and content. When she came over, she brought over one of my favorite foods, which I got to enjoy at a normal eating pace. We went shopping to plan a future party, and visited some stores for Poshmark sourcing. I even got additional time to prepare my listings for the following week! The day was busy, but I felt so relaxed and fulfilled. I did everything that I wanted to do. I relaxed when I felt like it, and I was able to focus on things that I enjoyed. My mind didn’t feel uneasy, and I was able to just enjoy things normally. The day prepared me mentally for the busy weekend. Even better, I still felt rejuvenated enough to go to work ready for the week. No big “case of the Mondays” or dreading the office. Just ready to do my job, no matter how busy it was going to be. Luckily for me, my boss was aware of what was going on with me. She sympathetized and agreed that so long as I didn’t have any urgent tasks, the day was mine. Unfortunately, I realize that having this kind of day is not possible for anyone. Sadly, it’s considered a luxury. However, if you can’t muster up a day, then try for few hours. It’s well worth it. Everyone needs some self care. We owe it to ourselves. Without it, we continue to feel depleted and stressed. 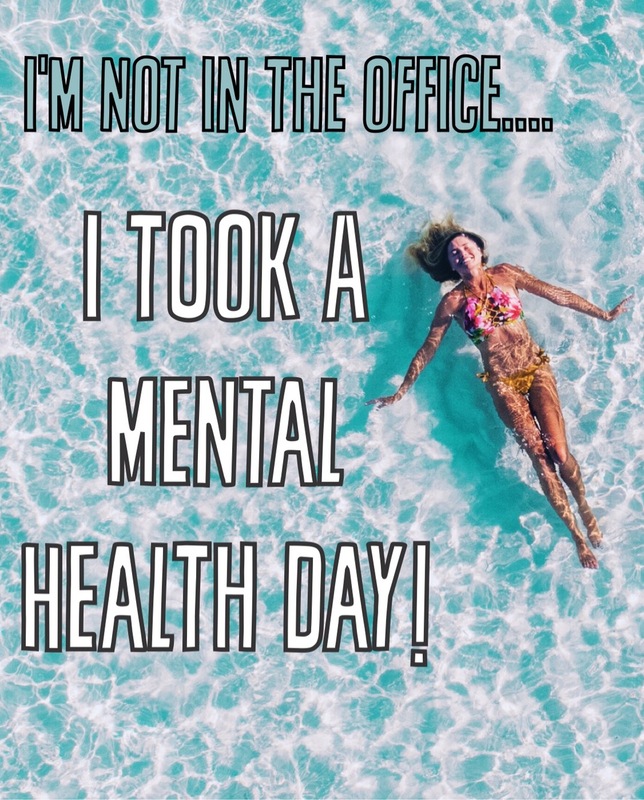 I’m hoping to incorporate another mental health day sometime in the future! © Jennifer R and This Mommy is Real 2017 - 2018. Unauthorized use and/or duplication of this material without express and written permission from this site’s author and/or owner is strictly prohibited. Excerpts and links may be used, provided that full and clear credit is given to Jennifer R and This Mommy is Real with appropriate and specific direction to the original content.